Authors: M. M. Brouwer, M.R. Visser, A Dvornik, et al. Despite being a near-perfect model and explaining everything ranging from galactic rotation curves to high-redshift supernovae observations, Lambda-CDM has its problems. A lack of clear candidates for a dark matter particle and dark energy are two that certainly keep physicists up at night. This leads us towards alleys unexplored – theories that are creative, innovative and crucial to the scientific process, theories that could lead us to the eventual model of the universe with a clear explanations of all observations. One such theory that garnered some attention in the last few years is Emergent Gravity. Fig 1. Galaxy rotation curves observed over the last few years indicate a dominant matter halo on the outskirts of galaxies, something that’s explained concretely by dark matter. What is ‘Emergent’ in Emergent Gravity? The idea is pretty radical yet basic – gravity isn’t a manifestation of mass in spacetime as proposed by Einstein’s General Relativity (GR) or a fundamental force that fits perfectly in a four-force model of the universe. Instead, gravity is proposed to be ’emerging’ from interactions between even more fundamental particles. This is akin to seeing thermodynamical parameters like pressure and temperature arising from interactions between atoms and molecules – what’s crucial to our discussion is the macroscopic quantity. In the case here, that quantity would be gravity. This idea has been developing over the last few decades, with Theodore Jacobson, Thanu Padmanabhan and more recently, Erik Verlinde contributing heavily to its development. Fig 2. 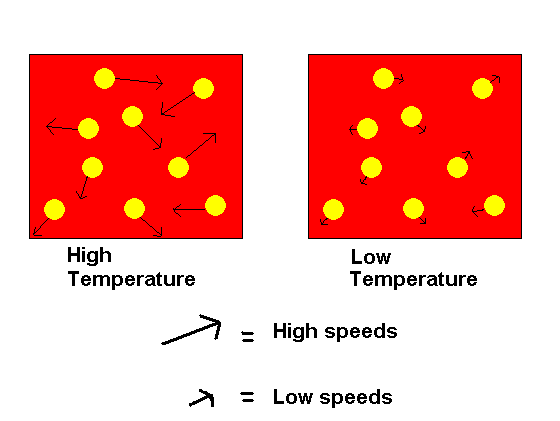 High speeds of particle collision against the walls of a container lead to higher temperature, since the system possesses more kinetic energy that gets converted to thermal energy. One aspect of a theoretical model like emergent gravity (EG) is that we are allowed to derive macroscopic results without having to worry about the underlying fundamental particles that could lead to gravity ’emerging’ – at least for now. This ’emergence’ can be thought of as the result of the tendency of a physical system to increase its entropy. Early work in the field towards a ‘thermodynamics-like theory of gravity’ used something called ‘holographic scaling of entropy’, which essentially scales with surface area of an enclosed volume of spacetime. Verlinde’s new work insists that due to dark energy, we see deviations in GR at long distances that can be resolved if this entropy scaling scales as volume instead of area. Keeping details aside, this leads to a different ‘force-law’, that has additional dominant matter terms that could explain dark matter (called ‘apparent dark matter’ in this case). This and this piece are excellent sources for details on the model. It can be seen that in some sense, this model combines the origin of dark matter and dark energy in a novel way. Well, how do we test this theory? Perhaps, passing it through the same standards as GR would seem appropriate. 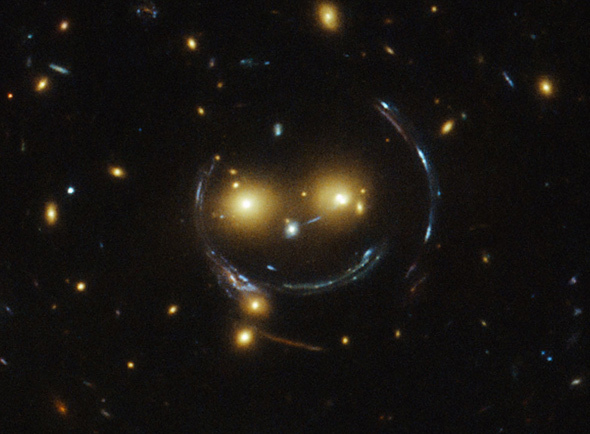 The idea of gravitational lensing was one of the first tests of GR i.e. the idea that light’s path gets distorted when traveling through curved spacetime surrounding massive objects. This distortion can change the light ray received from background galaxies (and hence, apparent shape and size) due to a foreground massive object like a galaxy or a galaxy cluster, leading to weak gravitational lensing. This galaxy-galaxy lensing signal is a massive success story of GR, as observations of this phenomena in the Universe fit into the model very well. Fig 3. Gravitational lensing leading to a drastic distortion in light coming from background galaxies. Credit: NASA-Hubble Space Telescope. Since EG still gives rise to ‘apparent dark matter’, it is safe to say that the gravitational lensing formalism stays the same, since we do apply this formalim to our universe’s dark matter-dominated objects like galaxy clusters (if we believe Lambda-CDM and its predictions). This allows us to use weak lensing as a test for emergent gravity, and match observations against the predictions of this theory. The regime studied in this work is the low-redshift universe, or the relatively local universe, where the Hubble Constant can be treated as a constant. This is almost true because of the dominance of dark energy after redshift ~0.7-0.9. Since Verlinde’s EG isn’t evolved enough as a theory to quantify cosmology before this epoch, this work assumes a background Lambda-CDM cosmology. For studying galaxy-galaxy lensing, Brouwer et al. select ~33,000 galaxies from the Galaxy And Mass Assembly (GAMA) survey as ‘lenses’ and KiDS survey galaxies as background galaxies that get lensed. They model these galaxies as having a static, spherically symmetric distribution of mass- something like a point mass or an extended source resembling a point mass- because that’s what EG can handle so far. This work calculates the lensing effect by measuring distortions in the background galaxies’ images, termed as a ‘shear’. In the framework of GR, this quantity is comprised in something called the Extended Surface Density (ESD) profile. Brouwer et al. calculated the ESD for these galaxies under the many assumptions of this model, compared them with Navarror-Frenk-White (NFW) profiles of galaxies from Lambda-CDM, and found that there was general agreement in the ESD progression between the two. Fig 4. From the paper, a model-fit of Emergent Gravity(Point mass model), Emergent Gravity (Extended model) and Dark Matter(NFW model). The lensing signal measured in the form of an ESD is plotted for four different galactic mass bins. It can be seen that Verlinde’s Emergent Gravity model assisted by teh assumptions made by Brouwer et al. match NFW profile predictions very well. So what are the assumptions? For one, EG cannot deal with evolution of the universe at the moment. Moreover, the theory isn’t developed enough to have a basic framework of what causes gravity to ’emerge’ from fundamental interactions. 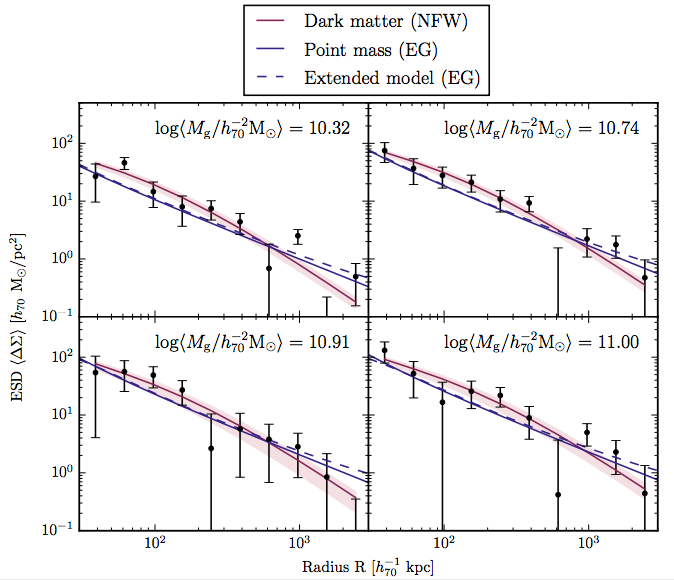 The paper agrees that a more ‘sophisticated implementation of both theories’ is needed to make a statement about whether apparent dark matter explains observations better than Lambda-CDM dark matter. Till then, EG shall keep on evolving and observations shall keep on being pitted against these evolving frameworks. A very exciting space to watch! For a more complete list of assumptions and details of EG in the context of observations, see Section 6, Conclusion of the paper above. The Bullet Cluster – A Smoking Gun for Dark Matter! Gravitational Lensing in the Canary Islands Strands in the Cosmic Web Cosmology Results from The Dark Energy Survey! I wouldn’t claim “exciting” since there are so many other GR & DM tests it has to pass, something it has in common with other MOND theories – they can do one thing (but GR does it better in all cases currently). Besides that there are the obvious MOND problems of predicting the CMB spatial spectra, as well cluster collision where DM doesn’t overlap BM, both cases where a MOND can be expected to fail trivially. But more problematic for this MOND is that it can be tested erroneous on how it handles quantum particle fields in the lab [ http://motls.blogspot.se/2010/01/erik-verlinde-why-gravity-cant-be.html ]. These are the factors that we should keep in mind, on the background that we have candidates for dark matter (either very high or low mass sector particles) and dark energy (vacuum energy), though opinion may differ on if they are “clear” or not.